Like sports, it's important to remember that music is just a game. And your kid doesn't think you're nearly as cool as others do. The above picture may be one of the greatest music-related pictures I've come across in some time. I mean, it's certainly not as iconic as all those Beatles pictures we're so used to seeing. You know the ones. Currently, we are all being endlessly inundated with a bunch of old black and white photos of The Beatles so that we can be once again reminded that A) The Beatles were a great band that we should care about (as if we're ever allowed to forget this) and B) that their entire catalog is now available on iTunes! I bet you didn't know that last fact because Apple only reminds us about a thousand times a day when they're not making me feel like less of a man for not having an iPad or the new iPhone4. But I digress. Some pictures of bands or musicians aren't quite so iconic--but still may be more poignant. 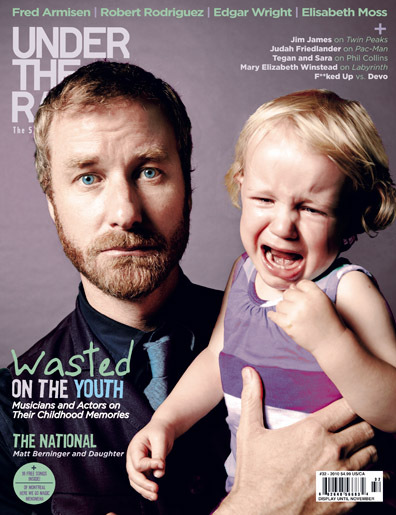 Case in point: The above picture is of Matt Berninger and his beautiful--albeit visibly upset--daughter, Isla. Matt Berninger is one of my favorite musicians and the lead singer and songwriter of one of my favoritest bands in all the known blue big world, The National. I had the good fortune to see The National in concert twice this year and one of those times (I can't remember which one), Mr. Berninger commented to the audience that he was really, quite a happy man living a happy life. The undeniably sad, dark, though beautiful songs, he claimed, portrayed a misery that was self-contained. He smiled and sipped his wine while saying this without a hint of irony or sarcasm. The guy really seemed to mean it and the ongoing joking banter between he and his bandmates suggested that despite the ultra-serious tone of their work, the artists behind that work don't take themselves quite so seriously. So I suppose this is one of those "perspective" moments I need every once in a while--a concept that goes overlooked and ignored about the things, the games, the art that I, and we, all dig so much. Ultimately, there are people--real people--behind all of this "stuff". And while some of them have really epic stories that make for tabloid and VH1 Behind the Music fodder, some of them are married dudes with a mortgage, a wife, and a kid who isn't remotely impressed by their dad's high ranking on year end "best of" album lists or hero worship from jerks like me. Somehow, that picture says it all and helps me to keep the music I love and find myself emotionally tugged by in the proper light. That picture represents in some ways everything that I want out of life. And no, it's not to be the well-dressed, ultra-talented lead singer of a critically-acclaimed band (not that I'm not working on it). Ultimately, I want to have the "incovenience"--dare I say the freedom--that comes with responsibility. A beautiful child I love and who loves me even if they're screaming their head off at me at the most inopportune time. A wife that I love and who loves me through thick and thin. And yeah, I want a life of purpose and a life where I can live right and do right by others and be the man God wants me to be. And of course I want to do all of this while listening to great music and getting my facial hair right and traveling the world and being great at my job and wearing some half-way decent clothes that fit my body which is slowly improving while keeping my blood pressure down so that I have the chance to see Kevin Durant and the Thunder eventually win the title. I'm gonna do it. Watch me. Just as soon as I get some lunch. I'm on it. Swear. So in the spirit of today's most likely annoyingly positive blog that no doubt has you punching the air and/or fist-pumping for your good buddy Rob, I'd like to offer a dozen overlooked gems from my collection by a dozen of my favorite dozen bands/artists. These are songs that aren't singles, aren't generally that well known, and will never be on a "best of" collection of theirs. 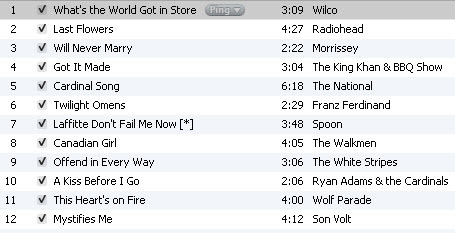 But they're songs I appreciate and try not to neglect remembering. So don't forget how much you love me and this blog. And I won't forget that there's a good life somewhere down the road. Somewhere. In the general area. I heard from a guy who knows a guy that something relatively decent is waiting out there for me. And you. In all likelihood. i'm a little late to the party, but thanks for the playlist. love it! got here by doing a little search on the national, seeing if they're coming back to my neck of the woods any time soon - saw them in stanley park, vancouver b.c. As i am now a mortgage carrying-father-husband i don't get out anywhere near often enough, but these guys are definitely worth it.